Now, which kind of employees does your organization have? A performance driven culture is necessary for an organization to reach its goals and achieve the target. Actively engaged employees build this culture within the organization and take up the responsibility of achieving the goals with appropriate support from management. It is proven fact that after a period of time the performance curve of any employee becomes stable and then a declining ramp. 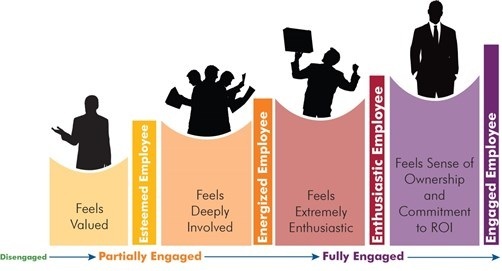 To avoid this phenomenon, the employee engagement drivers are to be triggered. The first and crucial step contributing to employee engagement is to bring in the awareness of what is expected out of an employee. Awareness of what to do is presented in the form of Employee-Specific goals framed holistically by the employee and his manager and is aligned with the organization goals. This makes the employee to feel the responsibility, understand his contribution to the organization and thus make him more engaged. The second step contributing to employee engagement is recognition and motivation. Every organization attributes its success to its motivated and engaged employees. Recognition should be specific, prompt, on-going and frequent. This recognition lets an employee know that he is valued and is self-motivated. This keeps an employee attracted to his goals and is motivated to experiment and deploy new methods in achieving his goals. Whether Maslow stated or not, it’s a fact to be accepted that every human craves for socialization. Socialization means the trust and friendliness factor within the team. This factor is built by team building activities and also adds to the employee engagement score. End of the day, success means win-win. Employee’s success should also be given equal importance as the organization’s goals. An employee should be offered a career and not a job and this makes an employee delighted and fully engaged. Wondered about how does this make sense to you? Proven study says that an organization with engaged employees resulted in 21% higher productivity and 22% higher profitability. To, automate these drivers of employee engagement, click here.